Okay Cocoa Fly folks, two words to describe the Thank God It's Natural line: Good Stuff. I was sent the Shea Butter Sample you see in the photo, which includes: peppermint lip balm, shea butter, and lemongrass olive-oil soap. My lips are in love with their balm. It is the best lip balm I've ever had. It lasts a long time. I don't need to continually apply it, like I have with others. And my lips are satin smooth. Their lip balm is my favorite product I tried. The shea butter is awesome. I used it as my hand lotion. Ladies and gents, my hands were so soft and moisturized. The shea butter kept my skin right during the cold and rainy days. And thank God for TGIN during allergy spells. Repetitive nose blowing, left my little nostrils raw and scaly. I was on my way into a meeting when I did one last check in my car mirror to make sure I was looking good. Ladies, we do that right? I saw my dry nose, dug through my purse, put the shea butter on and my nose looked much better. That little tub worked a miracle. It's good stuff. As for the soap, I didn't use it. The lemongrass has a strong scent and I don't do well with strong scents on my body. Sometimes I smell it when I need a pick me up. 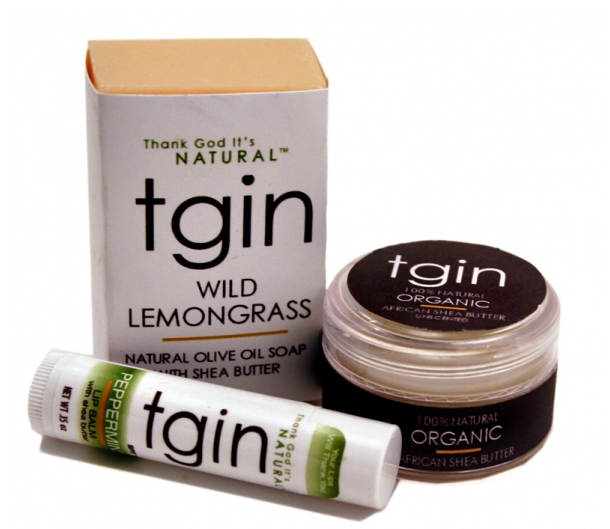 I read on the TLC website that lemongrass can reduce headaches, drowsiness or irritability. But their soap comes in other fragrances like ginger peach, cherry blossom and more. Or you can opt for unscented. I may try their unscented in the future. My only complaint is that the TGIN website is hard to find. The creator of TGIN Chris-Tia Donaldson is a Harvard Law School alum and author of the book "Thank God I'm Natural." I was confused as to whether the products are called Thank God I'm Natural or Thank God It's Natural. When you do a search for the products, Thank God I'm Natural blog pops up first. But that's an easy fix and I still think her products are great. One reason why TGIN is good stuff is because they seem to have good stuff in their products. I understood all of the ingredients when I read them. I didn't see any hydropoliphosphorouscrapthatwillgiveyoucancer on their packaging. I'm not only thankful for the products, but that YOU have a chance to experience them. Shoot me an email to cocoaflyblog@gmail.com with "TGIN" in the subject line and tell me something natural about yourself that you love. Deadline is Thursday, March 15th. The two best answers get their own sample pack! Here's a video of Chris-Tia Donaldson talking about how a bad wig, and near loss of a job led her to embrace her God-given kinks and curls.